Rubber Mats for Pitch Laps Sold! 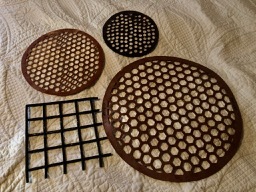 These are rubber mats for making molded pitch laps. 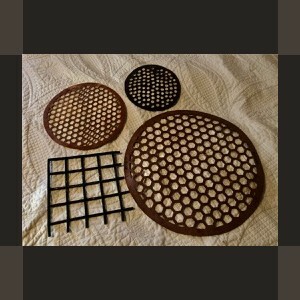 The sizes are 6" (round holes), 8" and 12.5" (hex holes), and an Edmund rubber grid mat for up to 8". All in good shape - may have some polishing agent that will wash right off. I'll mail these USPS in large envelopes for $3 each in the U.S.